The prime audience of this book is CICS and z/OS system programmers who provide support for Java application development and Java application programmers who need a gentle introduction to Java development for CICS. In this book, it assumes that you have knowledge of z/OS, CICS, UNIX� System Services, and Java. It starts by reviewing the basic concepts of the z/OS, CICS TS V3.2, and Java environments, and introduce new terminology. We then discuss the software and hardware requirements for developing and executing Java applications in CICS TS V3.2. Next we show you how to customize the application development environment, UNIX System Services, MVS�, and CICS. Additionally, it briefly discusses three possible application development roadmaps: Java application programs that use CICS services, IIOP server applications, and CICS Enterprise Beans. 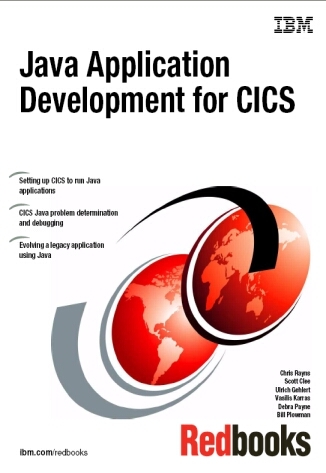 Subsequent chapters contain an expanded explanation and examples of Java application programs that use CICS services and how to use CICS-supplied Java class library and the Java Virtual Machine.